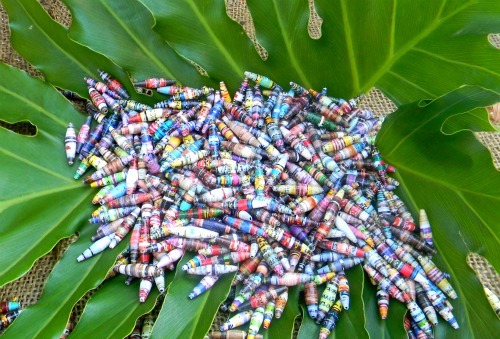 So you’ve made tons of paper beads because you just can’t stop making them! What do you do with it? My answer to this dilemma is to make curtain or a wall hanging. 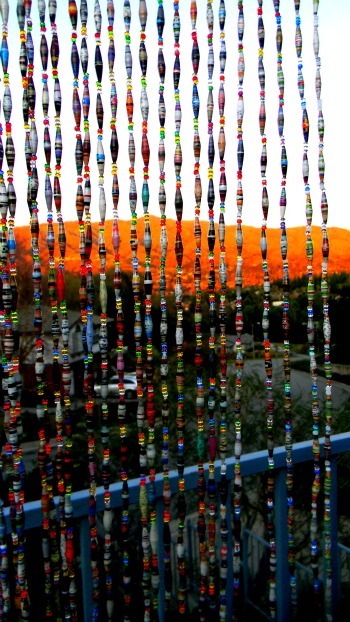 Here is a beaded curtain idea. I made them all uniform and coordinated but it does not have to be. You can string beads at random and put left over beads in between and it will come out like a work of art. I’ve got a box where I keep leftover beads after a project or bead sets that didn’t come out quite the way I wanted. My thought was that eventually I’d have enough to make a curtain–but I think it’s going to take a while! Did you add heavier beads at the ends of the strands to get them to hang straight? I love this idea! I think these beaded curtains, in addition to being useful, are very beautiful and very decorative! still a great idea Janice!